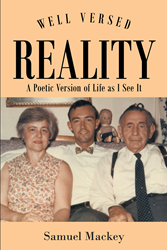 Recent release “Well Versed Reality: A Poetic Version of Life as I See It”, from Page Publishing author Samuel Mackey, is a whimsical and introspective collection of poetry based on the author’s observations of life and its many complex emotions, relationships and experiences. Samuel Mackey, a University of Virginia graduate, has completed his new book “Well Versed Reality: A Poetic Version of Life as I See It”, a whimsical collection of poetry reflecting on life and its many complicated circumstances and situations. Published by New York City-based Page Publishing, Samuel Mackey’s whimsical collection is a well-versed reference source to better explain reality, including all the confusing things [we] encounter in life: love, patriotism, politics, the feminine mystique, modern business, spin doctors (whom the author is none too fond of), advertisers, and pets. Though the work should not be deemed as infallible, the author hopes it will provide a lighthearted perspective in a world that is often too serious. Readers who wish to experience this whimsical work can purchase “Well Versed Reality: A Poetic Version of Life as I See It” at bookstores everywhere, or online at the Apple iTunes store, Amazon, Google Play or Barnes and Noble.